Corpora non agunt nisi fixata. This old saying of Ehrlich's describing the physi- ological role of receptors and their ligands might be paraphrased into Corpora non ambulant nisi fixata when considering lipid transport between and within cells. 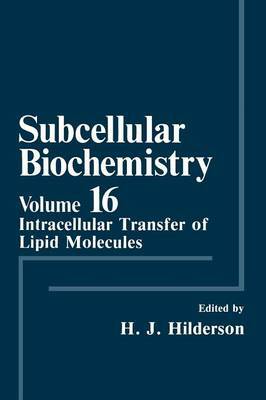 Volume 16 of Subcellular Biochemistry is intended to bring the reader up to date with this young field. Indeed, lipid transfer proteins have only recently become the subject of a more systematic study. In this book the current status and the emerging trends are discussed. Chapters cover protein-mediated transfer of fatty acids, phospholipids, phosphatidylinositol, glycolipids, dolichol, retinoids, and cholesterol in animal, plant, yeast, and other eukaryotic cells. Details are included of the study of lipid transport proteins by means of fluorescent phos- pholipid analogues and of the lipid transfer proteins as probes of membrane structure and function, as well as spontaneous lipid transfer as it occurs between biological membranes. Some of the chapters should be read in conjunction with Volume 13 of this series, devoted to fluorescence studies on biological mem- branes, in particular Chapter 2 (Somerharju et al. ) concentrating on studies in which fluorescent phospholipid analogues have been used. Chapter 10 (Bill- heimer and Reinhart), dealing with cholesterol trafficking, should be compared with Chapter 12 of Volume 13 (Van Blitterswijk), pointing to the existence of a preferential association of cholesterol with sphingomyelin, which drags choles- terol to the plasma membrane. In one chapter (Chapter 8: Van Dessel et al.